I've enjoyed cooking as long as I can remember. I cook almost all of my own meals, as I'd rather eat at home than in a restaurant. When I was a teenager, I took over cooking our family dinners from my Mother. Although she enjoyed preparing meals herself, she seemed to welcome the help. Over the years, I've amassed many cooking utensils and tools, and many of them go unused. As most cooks can relate, there are the utensils that you use, and there are the ones that just take up space in the cabinet. Pots and pans, sharp knives, spoons, spatulas, measuring cups, and cutting boards are all essential tools for your kitchen. But there are other utensils that are equally as important, as they make it much easier to prepare your meals, plus save you time. A pot drainer is an essential kitchen utensil, made of metal or plastic, that you place over the edge of a pot to drain off liquids. It has a raised lip for steadying against the pot, and a handle to keep the liquid or steam from burning your hand. Pot drainers are versatile, as they are for left or right-handed use. A pot drainer can be used to drain water from noodles or vegetables, or grease from cooked meats. 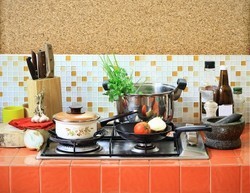 It's especially good if you plan to add ingredients to the noodles, vegetables or meats, and want to use the same pot. By draining the liquid, you cut out the step of transferring food from the pot, to a bowl, then back to the pot. This saves you time, plus cuts down on washing an extra bowl. Pot drainers are easy to use. Simply cover half of the pot with the strainer, then tilt the pot slowly to drain the liquid into a bowl or down the drain. Keep pressure on the strainer so it stays against the pot. The drainer holds the food in the pot, while the holes let the liquid pour through. Many people prefer colanders or wire strainers instead of pot drainers. I prefer the pot drainer, as it takes up very little room in a drawer. Plus, it is really easy to clean! I own two of these plastic pot strainers, and use them several times a week. I prefer the plastic to the metal, as they are a bit flexible. Plus, they don't seem to get as hot as the metal ones. These plastic pot strainers are easy to store in a drawer, plus easy to clean. I have used these same pot drainers for over 6 years, and never had them crack or break in any way. I highly recommend you purchase one or more of these, as they are truly essential cooking utensils. A vegetable peeler has a number of uses, and every kitchen needs one or two of these! A vegetable peeler works by removing a thin layer or peel from the surface of your food. I use my vegetable peeler to remove the skin of cucumbers, carrots and potatoes. I imagine they are also good for apples, or any other hard vegetable or fruit. I also use them to shave off thin slivers of hard cheese, and to make chocolate curls. I like Chef Harvey's Swiss Vegetable Peelers the best, as they have a really sharp blade, and are comfortable to hold. These peelers are quality peelers as they do the job quickly, with a minimum of effort. Plus, they clean up easily and last a long time! Amazon customers must agree, as they rate this Vegetable Peeler as 4 1/2 stars. Soften a stick of butter really quickly by shaving off thin slices with your peeler. Vegetable peelers make great pencil sharpeners! Graters, also known as shredders, are cooking utensils that are used to shred foods into smaller pieces. There are all types of graters available. Some of them are shaped like boxes, while others are flat. I prefer the box grater, as it has 4 different sizes of holes. I mainly use my grater to shred cheese. While it is more convenient to purchase pre-shredded cheese, I like the freshness and texture of freshly shredded cheese. I also use my grater to shred carrots, which I use in recipes such as carrot cake or in a salad. Kitchen tongs are probably one of the most versatile of the cooking utensils. Having a pair of tongs is like having an extra set of hands. Tongs keep you from burning your hands; getting your fingers dirty, and provides you with an extended reach. It's best to have several sizes of cooking tongs. I own three sizes: 9 inches, 12 inches, and 16 inches. I use the 12 and 16 inches tongs the most. The smaller size is the best for serving salads. These tongs are great because they have comfort-grip handles. They keep your hands from getting burned when moving or picking up hot foods. Plus, they are long enough that you don't have to put your hands inside of the oven or barbecue grill. These kitchen tongs also have scalloped tips, which help hold your food with a firm grip. I’ve had problems with straight tipped tongs, as they sometimes do not hold the food securely. If you ever have trouble opening a jar of pickles, then you definitely need several jar openers. They are made of rubber, and take up very little space in your kitchen. I've been using these for years, and cannot imagine not having one! I remember when we used to run water over jars, then tap them with a knife handle. Sometimes they opened easily, other times the jar broke. With these rubber jar openers, you don't have to worry about breaking the jar. In the past, I got these for free at home shows and the like. No one has offered me one in awhile, so now I purchase them online. I like this set, because it comes in a variety of sizes. The small one is great for opening bottled water. I use the larger ones for pickle & other jars. A great buy for a simple tool! The cooking utensils on this page are the ones I use most often, and highly recommend to anyone who spends time in the kitchen. They are all reasonably priced, easy to use, and last a long time. What other cooking utensils do you recommend? very interesting article. TY for posing. Most definitely! Mitts are extremely essential! Oven mitts. I couldn't function without them! No problem! They are great! A friend told me the same thing just yesterday! I imagine a slicer could be quite handy. If I had a lot of items to cut, I'd definitely invest in one. Thanks for the tip! One of the most useful tools in my kitchen is a slicer! I can get even, uniform slices without having to worry about cutting myself. I attach whatever i want to slice to the safeguard and just run it down the blade tower until nothing is left. You can even switch the setting for different types of cuts. You have reminded me that I need a new grater. And yes, I agree that the box style is the most useful. However, I've always used a colander and have never owned a pot strainer. Those sure look handy. Real kitchen utensils for cutting and preparing food, yet safe for little fingers and hands.